Carillion has been struggling to reorganize for the past six months amid debts of about 900 million pounds ($1.24 billion) and a pension deficit of 590 million pounds ($ 814 million). LONDON (AP) — One of the British state's biggest contractors collapsed Jan. 15, putting thousands of jobs at risk, after creditors and the government refused to bail out a company struggling under the weight of more than 1.5 billion pounds ($2.1 billion) of debt. Carillion said it had no choice but to go into compulsory liquidation after weekend talks with creditors failed to get the short-term financing it needed to continue operating. The construction and services company is working on major public works projects, such as the HS2 rail line in northern England, while also maintaining prisons, cleaning hospitals and providing school lunches. “This is a very sad day for Carillion, for our colleagues, suppliers and customers that we have been proud to serve over many years,” Chairman Philip Green said. The company employs 43,000 people worldwide who now face the risk of redundancy. Almost half of them are in the U.K., though Carillion has a presence also in Canada and the Middle East. Carillion has been struggling to reorganize for the past six months amid debts of about 900 million pounds ($1.24 billion) and a pension deficit of 590 million pounds ($ 814 million). Carillion's share price has plunged 70 percent in the last six months. 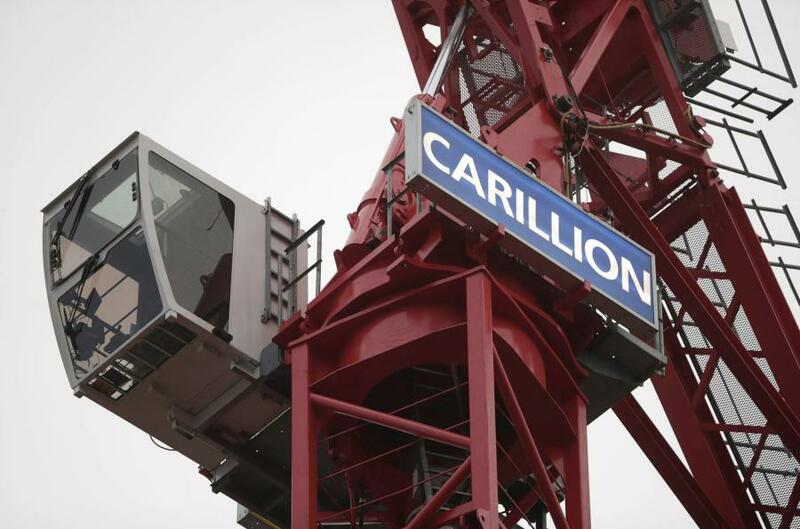 Britain's government refused to rescue Carillion, saying it could not be expected to bail out a private company. In the meantime, it said it would provide the necessary funding to maintain public services. “It is of course disappointing that Carillion has become insolvent, but our primary responsibility has always been (to) keep our essential public services running safely,” said David Lidington, head of the Cabinet Office. But questions remain about why the government continued to award contracts to the firm — even after it was having troubles. The opposition Labour Party said the government must move quickly to protect public services and ensure employees, supply chain companies, taxpayers and pension fund members are protected. “Given 2 billion pounds worth of government contracts were awarded in the time three profit warnings were given by Carillion, a serious investigation needs to be launched into the Government's handling of this matter,” said Labour lawmaker Jon Trickett. As critics debated the wisdom of contracting out civic services to private entities, Lidington rejected the notion that there would be a fire sale of assets. He said government departments had drawn contingency plans to be activated in the event of a collapse. In cases of joint partners on a contract, the other partners will take up the slack. “As we go forward, some services will be taken in house, some services will go out to alternative contractors in a managed, orderly fashion,” he told the BBC. Prime Minister Theresa May's spokesman, James Slack, denied that the government had been taken by surprise by the firm's collapse. He said some of Carillion's 450 public sector contracts might have to be taken over by the government, but there would not be a huge cost to taxpayers. David Birne, insolvency partner at chartered accountants H W Fisher & Company, said in a statement that it is extremely unusual for a company of Carillion's size to opt for liquidation rather than administration.